From corner to corner of the Midwest Partnership region, our tourism industry is creating specialized attractions that help you better enjoy the great outdoors, get back to your agricultural roots or perhaps channel your inner artist. Restored buildings house coffee shops and theaters. Old railways hold more than 80 miles of serene bike trails. Cooperative farms invite guests to join a farm to table meal - which may only be a few feet from the garden. 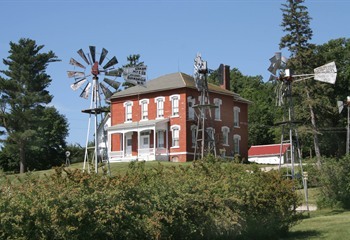 These unique attractions only add to the quality of life you can experience in Adair, Audubon, Greene and Guthrie counties, in the Western Iowa Tourism Region. "The Iowa Tourism Office has released new data showing continued growth in the state's tourism industry. Over the past five years, travel-genereated expenditures have increased by an average of 5.94 percent, beating the five year national average of 5.78 percent. According to the study, "The Economic Impact of Travel of Iowa Counties," travelers spent $8.06 billion in Iowa and generated $374 million in state tax revenues in 2014, both all-all time highs." -- 10/9/15 IEDA News Release. The tourism industry in Midwest Partnership's four county region of Adair, Audubon, Greene, and Guthrie Counties reflects a similar growth to the state-wide trend. Consider exploring all that the region has to offer. 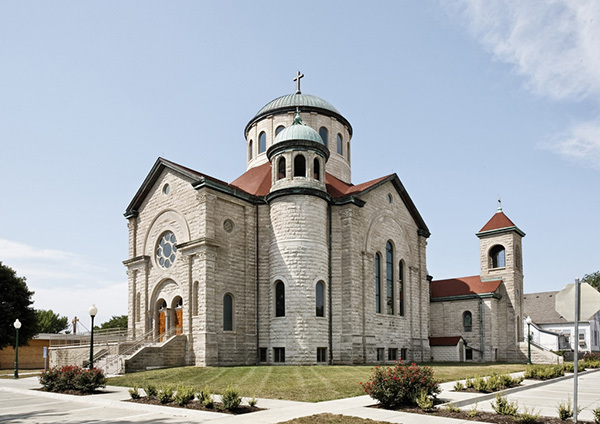 The Historic All Saints Church in Stuart, Iowa has been transformed by a $4 million restoration project and now the Saints Center is officially open! The former church was once voted the Most Beautiful Church in Iowa by the readers of the Des Moines Register, but then fell victim to a hate crime in 1995 by an arsonist who wanted to "take the heart and soul out of a community". From the moment Ed and Eva Warren opened the doors of their new building in December 1896, the Opera House took its place as the “grand lady” of the Greenfield town square. With its expansive windows, oxidized copper accents, and distinctive turret, the three-story brick structure served as a landmark for culture and commerce. For decades the Opera House drew theatrical troupes, musical performers, and local acts. But as times changed, so did entertainment tastes. The last documented “professional” act was presented in 1930. After that, the theater hosted only occasional community events, such as graduations, dances, and basketball games. Though the ground floor continued to house retail businesses into the 1990s, by the late 1940s the theater space fell into complete disuse. The building was placed on the National Register of Historic Places in 1979. Efforts to restore it, however, did not begin in earnest until 1994, when it was given to Main Street Greenfield. In 2000 the EE Warren Opera House Association was formed to coordinate efforts and oversee what became a $6.2 million makeover. Through the work of historical restoration experts, the auditorium and other rooms have been returned to their original grandeur. The Warren Cultural Center opened its doors in Spring 2012 and now serves as a multi-use facility, hosting meetings, receptions and overnight guests, as well as performances in its historic rooms. Ed & Eva’s retail store offers unique items from more than 40 different Iowa artists, and the gallery/lobby displays exhibits of art and photography. The Freedom Rock is a large (approx. 60+ ton) boulder located in rural Iowa that is repainted every year with a different Thank You for our nations Veterans to honor their service to our country. The artist, Ray "Bubba" Sorensen II, was inspired by the movie Saving Private Ryan, as well as, wanting to give Veterans a unique recognition on Memorial Day. Sorensen paints The Freedom Rock on his own with the tremendous support of family and friends. Sorensen is not commissioned to paint the rock but is able to do so each year with the generous help of donations. The Country Life Center location of The Wallace Centers of Iowa is the birthplace farm of Henry A. Wallace, born in 1888. He served the nation as U.S. Secretary of Agriculture from 1933 to 1941, U.S. Vice President from 1941 to 1945, and U.S. Secretary of Commerce from 1945 to 1946. Earlier in his career, he founded seed corn company Pioneer Hi-Bred in 1926 and was an editor at Wallaces' Farmer magazine. In 1999, The Des Moines Register named Wallace the "Most Influential Iowan of the 20th Century." We have a variety of activities and lodging options to tailor your overnight stay with us while you enjoy exciting outdoor adventures. Enjoy the rolling hills landscape and wildlife! 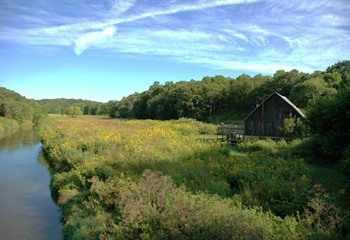 Walk, hike, bring your bike or horse, and ride our 30+ miles of trails. Fish in one of our many ponds, explore the oak savannah habitats, or just sit back, relax, and enjoy an escape from the hectic pace of everyday life. Spend a quiet weekend in our comfortable lodging. Choose between several options. Stay at the historic Garst Farmhouse, home of Roswell and Elizabeth Garst, cozy cottages or spacious farmhouse. Groups are easily accommodated so bring your family and friends and spend a night. If you enjoy the outdoors, Whiterock also offers low-impact campgrounds and a remote 3-season cabin on the banks of the Middle Raccoon River. Whiterock Conservancy is the perfect setting for family reunions, corporate retreats, weddings, parties, motor coach and group tours, or just a quiet weekend getaway for two. Lake Panorama National Golf Resort and Conference Center is a unique get-away destination. Whether for a day, long weekend or more, the resort has plenty to offer. This one-of-a-kind resort offers an 18-hole championship golf course, full-service restaurant, banquet and meeting room facilities, and lodging, all in one location. The main attraction is the par-72 golf course that has been recognized as one of Iowa’s most popular and well-conditioned courses for the past four decades. With superb playing conditions throughout the golf season, the course has earned a 4-Star Rating from Golf Digest in its “Places to Play in America” publication. The 89 mile paved trail begins just outside downtown Jefferson, in Greene County and is used for biking, running, walking, inline skating and cross country skiing. The trail runs from Jefferson to the Des Moines metro, making the RRVT the longest trail in Iowa and one of the longest in the nation. On one corner of the Jefferson town square is located a fourteen-story carillon. The structure is built of glass and ceramic cement. After taking a ride on a glass elevator to the 120-foot high observation deck, visitors can view the city and its surrounding countryside. The fourteen cast bells chime the time of day every 15 minutes; concerts are also offered daily at 11:00 a.m., 2:00 p.m., and 5:00 p.m. The annual Bell Tower Festival is held the second weekend in June; events during that time include parade, live performances, rodeo, carnival rides, craft exhibits, and a car show. RVP~1875, the world’s only producing historical furniture shop and museum, is located in the century-old Milligan Lumber Grain & Coal building in Jefferson, Iowa. Owner, Robby Pedersen, is a Master Furniture Maker with over 20 years experience, who has built over 800 pieces of historically accurate furniture using only the tools, techniques and finishes used in 1875 Iowa. On display is the largest working set of 19th Century woodworking tools well...anywhere. Our shop features an 1860’s foot-powered lathe, an 1870’s hand-crank ripsaw, and over 400 different hand planes. The showroom displays over 100 pieces of furniture, each with a story of historical significance. Robby passionately shares his love of historic furniture making and how it relates to Iowa history with his visitors.